The leading cause of blindness in those 60 and older, macular degeneration blurs the sharp, central vision and affects the part of the eye needed to see fine detail. Macular degeneration affects both distance and close vision, and can make some activities - like threading a needle or reading - difficult or impossible. Macular degeneration is damage or breakdown of the macula, the small area at the back of the eye that allows us to see fine details clearly. When the macula doesn't function correctly, we experience blurriness or darkness in the center of our vision. and Straight lines look distorted. Special photographs, called angiograms, are taken to find abnormal blood vessels under the retina. A vegetable-based dye called fluorescein is injected through a vein in your arm, while your eye is photographed as the dye passes through the blood vessels in the back of the eye. 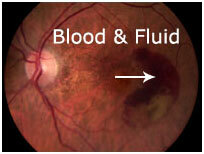 Sometimes fundus autofluorescence images are used to detect areas of dysfunctional or atrophic macular tissue. 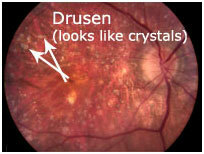 There is no cure yet for "dry" macular degeneration although treatment advances are being made. Treatment of this condition focuses on lifestyle modifications to reduce the risk of progression and helping a person find ways to cope with visual impairment. We will advise you on appropriate antioxidant vitamins that you may take that can reduce the rate of vision loss from AMD by 25% each year. You will also receive instruction on self-monitoring with an Amsler grid. Treatment for the wet form of macular degeneration has been revolutionized, and the staff at Retina Care Specialists were involved in the landmark clinical trials that led to the current state of the art treatments. The standard of care treatment for wet macular degeneration involves injecting a medication into the eye called a "VEGF inhibitor." The three commonly used VEGF inhibitors are Avastin, Lucentis, and Eylea. Lucentis and Eylea are FDA approved while Avastin is used off label. The medication is injected directly into the eye with a tiny needle. The treatment takes just a few minutes and is painless, and often needs to be repeated after a month or longer. This treatment halts the cycle of vision loss in 90% of patients, and many patients eventually have improvement in vision. Blindness has been prevented in countless people world-wide due to VEGF inhibitors. Some other recent advances are a home monitoring device patients can use to aid in early detection of converting from dry to wet macular degeneration, and an implantable miniature telescope for patients with advanced macular scarring in both eyes. The horizon continues to hold promise for better treatments with new medications currently in development for slowing the progression of dry macular degeneration.